Winchester’s dedication to quality and performance have never wavered since the company was first founded in 1866 in New Haven, Connecticut. With the introduction of the 45 ACP 230gr Jacketed Hollow Point, that dedication lives on with superior performance at a truly affordable price. Giving you the freedom to no longer have to compromise between your budget and your safety. 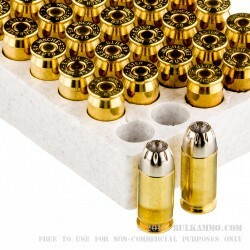 The 230gr jacketed hollow point round has one of the highest velocities in its class, an astonishing 880 feet per second for the 230gr round. 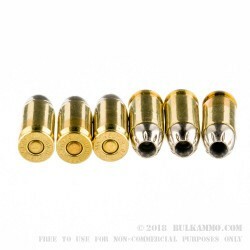 The copper jacketed hollow point serves to both lubricate the round across the feed ramp, reducing the chances of failure to feed malfunctions, and provides extra rigidity along the bullets shank to prevent premature expansion of the round upon impact. Muzzle energy was engineered to come in a perfect 400 foot lbs force, and is ideal for producing rounds that will penetrate, but not perforate the target. An undervalued characteristic that serves to both maximize the transfer of energy into the target, and prevents secondary casualties by mitigating terminal cavity perforation into secondary obstacles behind the intended target. 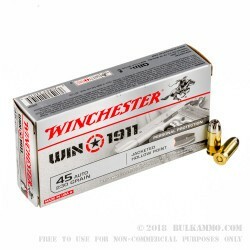 The Winchester 230gr jacketed hollow point is everything that you need in a self defense round, at a price that will keep you armed for decades to come.